In this crazy thing we call life, projects seem to be never ending. There always seems to be something that needs to be worked on around the home. Craft and hobby projects that we want to tackle. Projects that need attention at work or for school. It often feels that we just finish one and two more pop up. Keeping on track with our projects, whether they’re for fun or necessity can be tough. 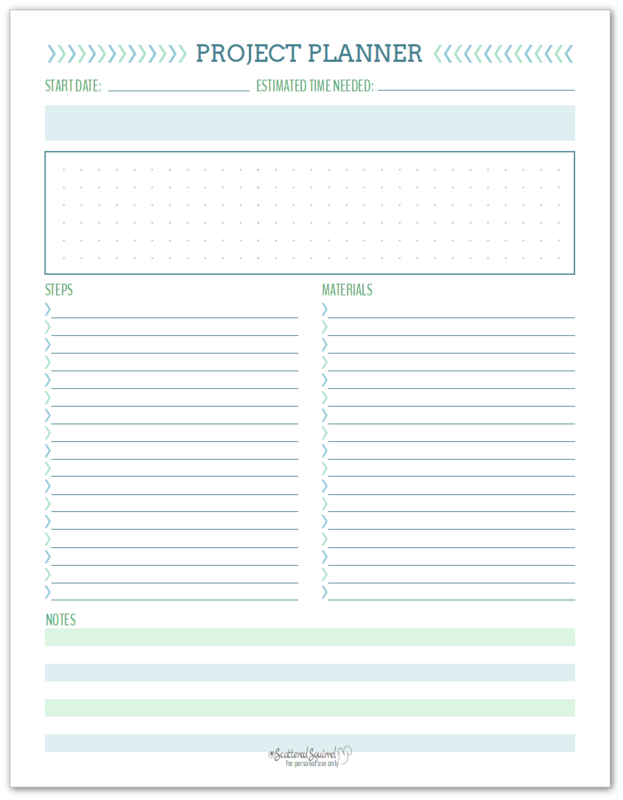 That’s why I created a project planning printable set. In our family, I tend to be the one who keeps track of all the projects we have on the go. I’m not sure how I ended up being the project keeper, but I did. I don’t mind. After all I love making lists and planning things. There’s just one problem – I’m a scatter-brain and if I don’t have a way to keep track of what we have going on, or need to do, nothing will ever get done. Seriously! Deadlines will be missed. The workload will quadruple before I remember that – oh yeah – we were going to clear out the clutter from that space last year. Oops! Now, we have an extra year’s worth of stuff to go through. You see the dilemma. Over the years I’ve tried a number of different systems to help work with my scattered brain. Lists – which work great, but over time they need to be rewritten, and I found I was rewriting things too often, or not updating them as I should. Dedicated Notebook – this worked for a bit, but it got very confusing over time as I updated the information. Scheduled Them in my Planner – the goal with this was to make time to actually get the projects done. The idea was great, but I was finding that information about various projects was getting scattered amoung the months and weeks. As you can see, some worked better than others, but none stood the test of time. I finally decided it was time to figure out a way to organize our projects in a way that help us stay on track and that would be easy to maintain as time went on. We have a variety of different kinds of projects on the go at any given time. Aside from home projects, we each have our own hobbies and interests, and I wanted to create a system that was flexible enough to accommodate them all and was still easy to set up and maintain. That’s where the new project planning printable set comes in. I knew right from the beginning that one printable wasn’t going to be enough for this. My goal was a system for planning and tracking our projects. With multiple projects on the go in our family, I knew I needed something to help me keep track of all of them. The easiest way I could think of was to create an index for the projects. Easy to set up and easy to maintain were the two criteria I used for the Index. As you can see in the picture above it’s just a simple list. There’s room to write down what the project is, the page number (if you want to use that column) as well as the Start and End. I plan to use those last columns as check boxes, but I made them big enough to put in dates if that’s what works best for you. Next come the project planner itself. 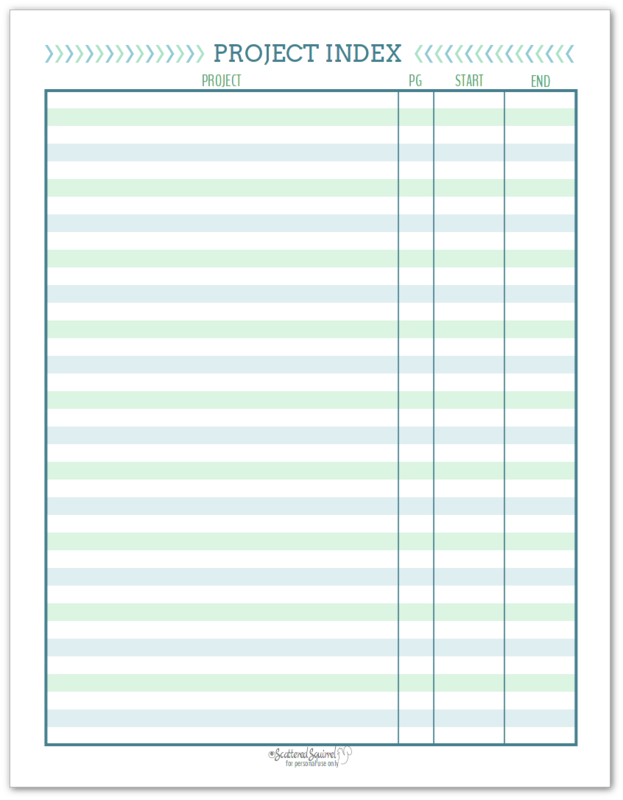 This printable was designed to keep track of all the details for a project. This, by far, was one of the biggests challenges with my previous systems. I figured having one page to keep track of all the details was a good idea. Again, it’s simple. There’s space for jotting down ideas for the project, materials needed, and the steps needed to complete it. I find that breaking a project into steps can really help me to visualize how much time is going to be needed to complete it. I realize that some projects might not really need steps, so this area could also be used for shopping lists, reminders, or anything else you might need. 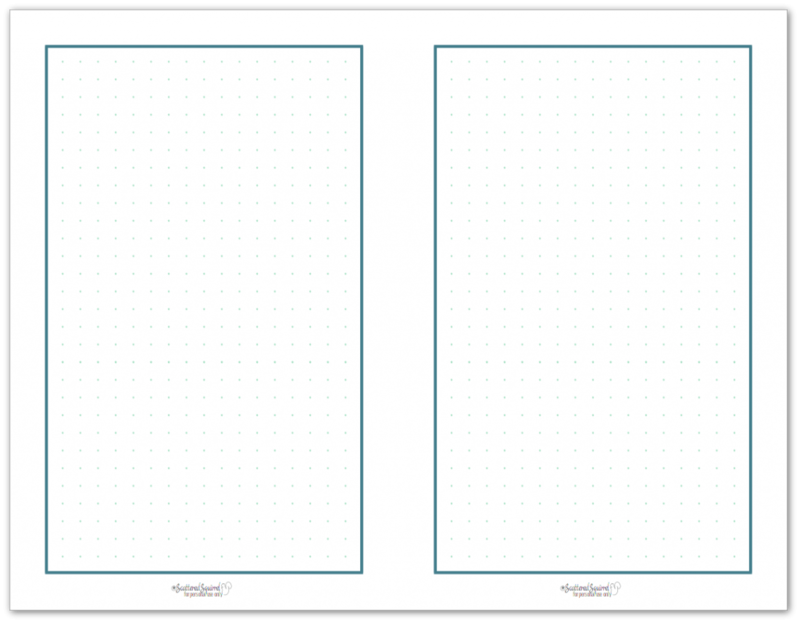 On the opposite side I plan to print the matching grid paper so there is room for extra notes as the project progresses. 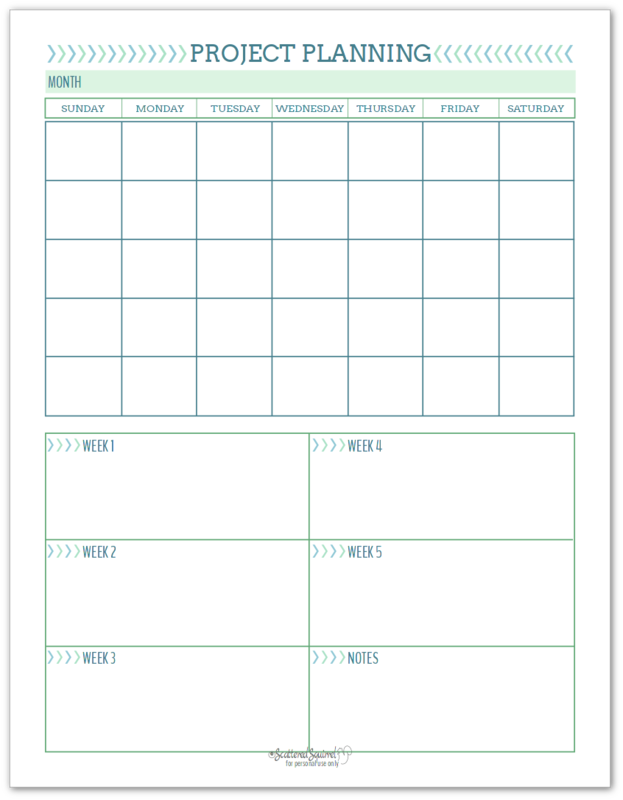 The last project planning printable in the set is a monthly planning page. Not all projects need detailed planning like this, but for some of the bigger projects I found this to come in really handy. It allows me to plan out a larger project over a month or more if needed. The weeks at the bottom gives me room to plan in more detail. This way we can break tasks down into easy to manage chunks, and visualize how much time it’s going to take. For those that enjoy using the half-size printables, I didn’t forget about you. All the pages are exactly the same, with one exception. 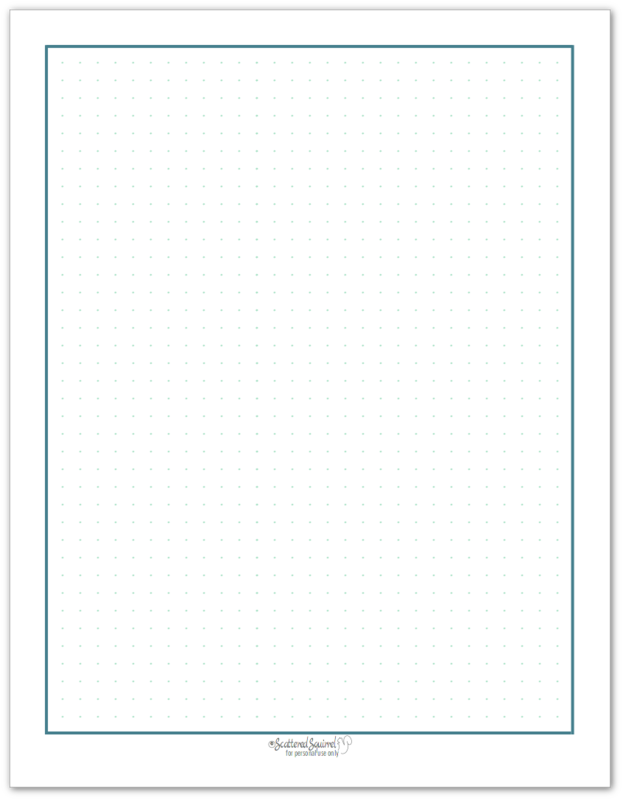 The monthly planning page is broken into two half-size pages. This way you don’t lose any planning room. I’m slowly moving all our projects over to this system. I set up a section in my general planner so that everyone knows where to find them. I tucked some of the monthly planning pages into the back of that section so they’re easy to access when we plan a larger project. I don’t use those pages until we’re ready to start the project, so it helps keeps the bulk down a bit. When we do start a project that needs planning like that, I tuck the monthly page behind the project planner and use a paper clip to hold them together. So far, this systems seems very promising. It’s easy to add projects on the fly and keep updated. I’m hopeful this will be a system that lasts for a long time. Do you have a lot of projects on the go? How do you stay on track with them? 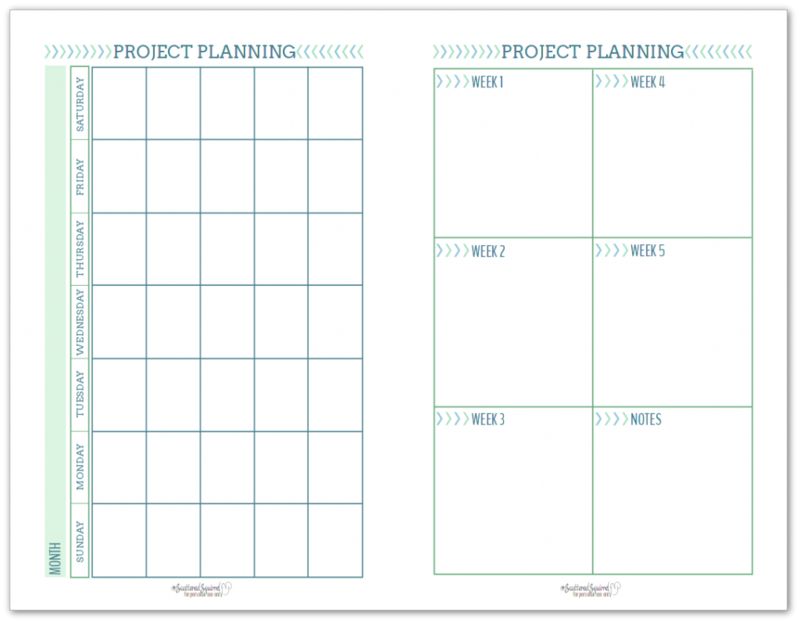 Will the project planning printable set be a help to you? Drop me a line in the comments below and let’s keep the conversation going. Oh what a happy co-incidence! I’m happy to hear that you like the project planners. These are really great. I am trying to get my arms wrapped around some projects around here, but getting them organized is a challenge. I hope these help! One note, though, the half-size project index links to a png image rather than a pdf file. Thanks so much for the heads up about the link, it’s all fixed now. I’m happy you like them. I’d love to hear how they work out for you. 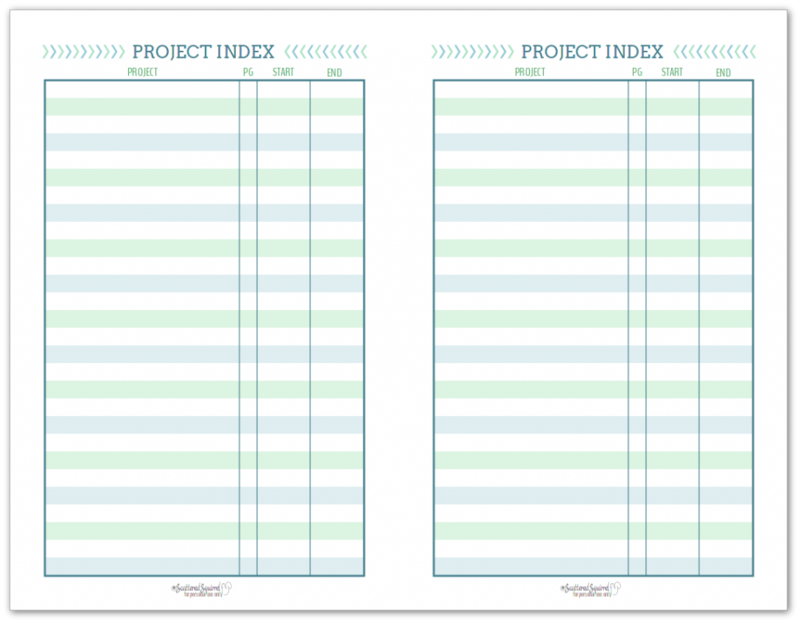 The Half-Size Project Index Page appears to be a png file instead of pdf? Just thought I’d ask just in case it’s a typo. 🙂 Thanks for the set though! I think it will be really useful for me. Thanks so much for letting me know, it’s all fixed. The picture should take you to the PDF now. I hope you enjoy using them. I’d love to hear how they work out for you. I love these! I don’t know that my comment will help anyone else, but these are great for me because I have ADHD, and I’m a college student — about ten years until retirement age. This will keep the following scenario from happening — and it has happened more times than I am prepared to admit! I walk into class and the instructor says, “Turn in your (name that project or paper.” Or, they say, “Don’t forget today’s test.” You get the picture. Thank you for the help! 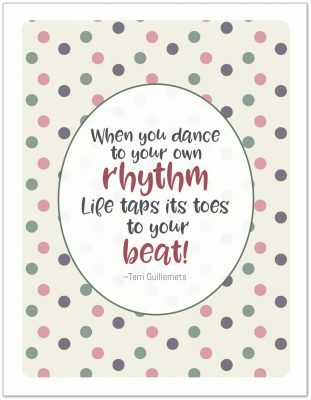 Hi Shelley, what a great way to make these printables work for you. I hope they come in handy for your during your studies! I have nightmares of that and I graduated college 20+ years ago. Although I think my nightmares are caused more by CURRENT projects even though the dreams tend to be about COLLEGE. It’s strange what sticks with us years after we’re finished something isn’t it? 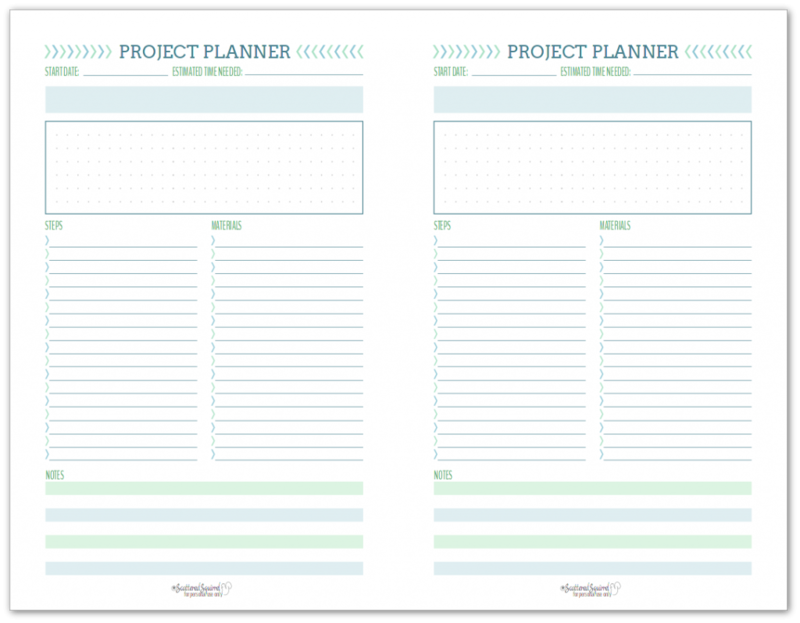 I hope that you find the project planning set helpful for your current projects. That’s a fantastic way to find what works for you Jennifer! I do the same thing. I think it’s my favourite thing about making my own planners, being able to test and change things up so they work for me. 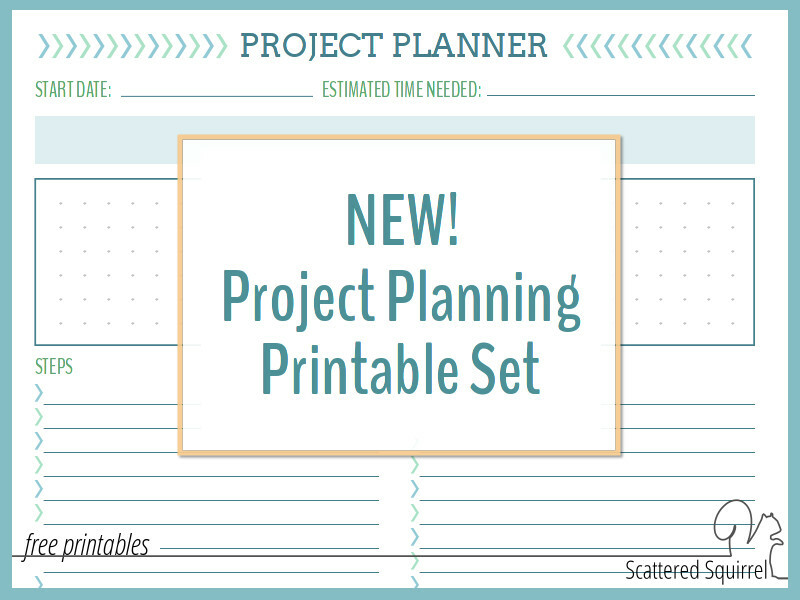 I hope the project planner set helps you. I’ve found it to be super helpful, especially right now when we’re in the middle of getting ready to move. Thank You so much! This is just what I was looking for. The fact that it has no dates is golden. I’m happy you like it Gwen! I hope you find it useful. I love your site–thank you so much for creating these planners! Every time I find I want some kind of printable worksheet I know to come here and I will find exactly what I need. Earlier I wanted a way to do some goal planner. This week I realized I needed a better system for a big project I just started. And again you did not disappoint! So thank you, thank you!